Tracing the graphic art made by Emory Douglas while he worked as minister of culture for the Black Panther Party from 1967 until its discontinuation in the early 1980s, this MOCA exhibit is a must. 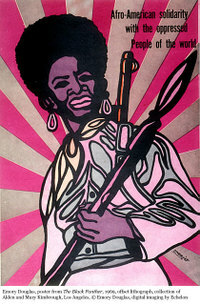 Douglas’s powerful visuals helped define the trademark visual style of the group’s newspapers, posters, and pamphlets. Douglas’s substantial body of work exists as a powerful graphic record of the Black Panthers’ legacy, reflecting their development and evolving mission to improve the lives of African Americans by calling for resistance and change, as well providing social services to their communities. With a firm understanding of the need to disseminate information and communicate the party’s agenda visually, Douglas’s bold illustrations and striking images spoke forcefully to a community ravaged by poverty, police brutality, and poor living conditions. With unmistakable humanism, Douglas portrayed a populace that was emerging from segregation and proudly fighting to assert their rights to equality. Organized by MOCA Ahmanson Curatorial Fellow Sam Durant, the exhibition includes approximately 150 of Douglas’s most influential works, which serve as a testament to the efficacy of visual art to communicate a political position. Through January 20, 2008. Free. Museum of Contemporary Art, 8687 Melrose Ave., Design Plaza G102, West Hollywood, 310-289-5223. www.moca.org.